For my adventure I choose a 2008 Honda Varadero. Lots of research went into my decision as there are endless options available. The decision was not an easy one and it really came down to a test drive, so I took out all of the bikes that made my short list. Once I got off the Honda Varadero I knew I had to buy it. Case Closed. The Honda reliability, worldwide representation only added confidence to my decision, this is a decision that I don’t regret. 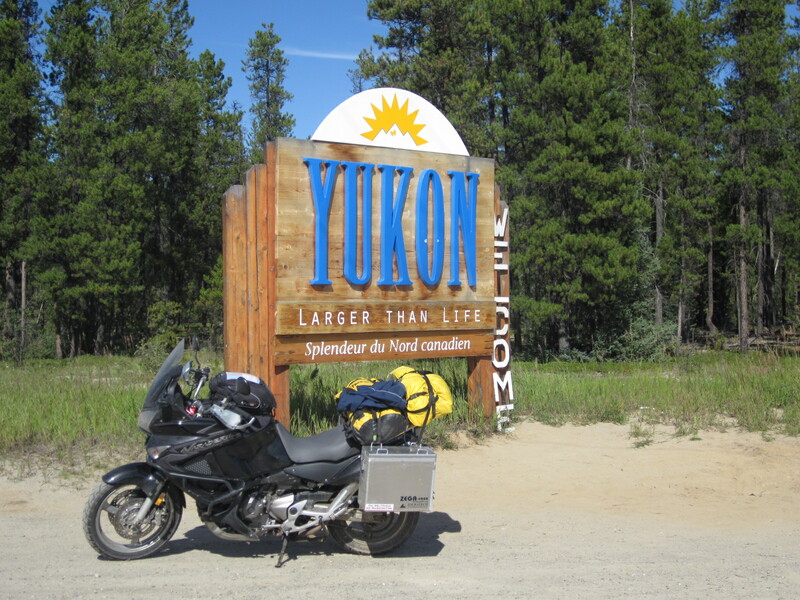 As of this posting, September 5, 2011 I have 38,630 Kilometers on this bike without a moment of trouble. It has gone to Cape Spear Newfoundland, Homer Alaska and Prudhoe Bay, Alaska with ease. I don’t shy away from any road. Kaoko Throttle Lock – I don’t really like this throttle lock, I find it awkward to use and would not recommend it. I have two Honda’s, been riding since my wife passed away 5 yrs ago…2002 Gold Wing and 2004 VTX. I will ride Mexico this year, to visit my uncle in Guatemala. I had reservations about it until I read your account. I may just trade in my Gold Wing and get me a new Varadaro with the additions you recommend. Questions: 1) What throttle lock would you recommend? Lock or cruise control is a plus because of arthritis in my hands..I’m 68 2) How about the roads in Mexico? I noticed you said there were stretches of rough roads. How is the Varadaro on gravel? 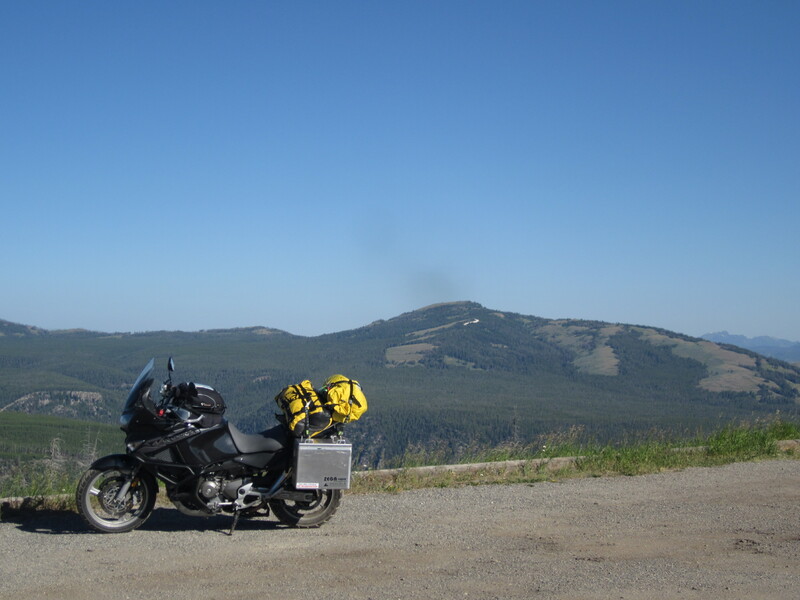 I do not feel comfortable on gravel or loose surface with the Gold Wing. Was looking at BMW for this reason for trip to Canada. My knees are not in real good shape because of arthritis but I keep my quads are strong and having prolothreapy PRP treatment on knees that’s supposed to work. Should I expect lots of unpaved roads? 3) I guess GPS is good in Mexico?..even in remote areas? 4) Drinking in water in Mexico and food prepared with water. I’m sure I’d need to have bottled water. What kind of hassle is that?…or is it even possible? 5) I don’t have a co-rider friend to make this trip with me. Solo ok? 6) What if I took a woman rider on my cycle? Anything I should consider? THANKS. You’ve given me hope for such a trip. I hated my throttle lock that I bought for the Varadero!! I had a ‘lock” style on my old cruiser and found it much better. 2) How about the roads in Mexico? I noticed you said there were stretches of rough roads. How is the Varadaro on gravel? I do not feel comfortable on gravel or loose surface with the Gold Wing. Was looking at BMW for this reason for trip to Canada. My knees are not in real good shape because of arthritis but I keep my quads are strong and having prolothreapy PRP treatment on knees that’s supposed to work. Should I expect lots of unpaved roads? Roads in Mexico offer great variety. The biggest problem is “topes” or the speed bumps, they are high. You need a lot of clearance. Varadero, V-Strom, Tiger, BWM type adventure bike is the answer. You can have as much gravel as you want, or as much pavement as you want. You can cross Mexico 100% on pavement. 3) I guess GPS is good in Mexico?..even in remote areas? I did not use a GPS so I cant answer this one. I have heard that others have used one and were fine. 4) Drinking in water in Mexico and food prepared with water. I’m sure I’d need to have bottled water. What kind of hassle is that?…or is it even possible? Don’t drink water unless it is bottled. Always carry 2 or 3 with you but you will have no trouble finding bottled water. 5) I don’t have a co-rider friend to make this trip with me. Solo ok? 6) What if I took a woman rider on my cycle? Anything I should consider? Women that I have had on my bike tend to want to stop every 200km, I can ride much longer than that. Bathroom breaks are more frequent. With another rider it means taking more stuff, you will really need to watch what you pack. Greg’s advice is very good. I’m a Canadian who has lived in Mexico for more than two decades and ridden on and off road over that time period. Taking a partner on the trip will entail thinking and acting for two. If you can get along you’ll be fine, if you can’t it’ll be hell on earth with temp and humidity to match. You’ll be good to go solo. I met Greg here when he came through, he had adapted to Mexico very quick and enjoyed his trip through the Republic. DO NOT DRINK THE WATER PERIOD. Even if a resort or hotel tells you it is safe, don’t bother relying on the hotel maintenance staff to keep you healthy. Bottled water is very cheap, there are many national safe brands, I get home delivery of Bonafont for example. Food and ice is usually good, however, uncooked or raw you better watch out with a gringo belly. Ice machines don’t run very well using unpurified water and ice supply companies are usually ok. I never have a problem with ice. Watch for dirty dishes, cracked or chipped etc…no fun. GPS works in most places, for peace of mind, get a Spot device and use it properly. Don’t go hitting the emergency button if a cop pulls you over in a city. If you have health concerns, medical care and medicines are widely available and you will get what you pay for. Some drugs can be more expensive, but you can usually get a prescription written by a doctor who works for the pharmacy for only about $5 dollars as the consult fee. Narcotics are harder to get nowadays. Mileage will be low on a daily basis unless you ride the cuota or toll roads which have been half price for bikes for about two years now. Insurance is mandatory and just a damn good idea. Medivac services are available, your OHIP won’t count worth a damn here, and you’ll likely have to pay cash or credit card and get reimbursed by your insurance carrier. If you do not think you could make a cross Canada trip, you will find Mexico much more difficult. Be honest with yourself and think of the riding conditions and road conditions. Toll cuota roads are usually fine, in fact, the toll ticket is your insurance which covers you for damages to your bike caused by the road surface while you are on it. Keep your toll ticket until you get another toll ticket. Secondary roads require more skill and patience. You will be expected to ride like a motorcyclist. The above means throwing everything you have ever learned about safe and courteous motorcycling out the window and starting from scratch to see what you need and what doesn’t work here. Forget the cooling vests and cooling bandanas etc…They work for about an hour and then leave you wet and miserable for the remainder of the day, they also get absolutely filthy after a few hours here. If you ride a loaded Gold Wing two up, you will need an education course in how to handle the tope speed bumps. The learning curve is steep and can be expensive. You will find Mexico to be totally different from what you think. It is a nation filled with friendly helpful people who are always happy to see a Canadian, even though the Canadian government treats them like dirt. This speaks volumes for the Mexican people and is a disgrace to Canada. Enough of that. Your chances of encountering any kind of danger to your personal safety are slim to nill. If you are not drinking on beaches or using drugs after dark, if you are not frequenting strip clubs, if you are not flashing expensive electronics and money, if you are not walking around with a big sign on you saying, “I am a gringo, please take what you want from me”, you will be fine. The sign doesn’t have to be written in Spanish. If you would like a free illustrated ride guide to the area of Mexico where I live (Veracruz-Puebla), please contact Greg, I consider Greg to be a motorcycling buddy and he will put you in touch with me. I would be happy to help you plan and do your Mexican motorcycling adventure. You will ride some of the best roads in the world for motorcycling and see some amazing things and hopefully become an ambassador for riding in Mexico and spread the word about how totally wrong the news reports and embassy warnings are about this nation. Hope to meet you some day. Happy to see a place where we can find the truth about Mexico. (sorry for my english, I usually speak french). reted a motorcycle 10 years ago in Playa Del Carmen. Bought one the first day I got home! Travelled to Mayan Riviera 2 times in the last years with a Ford 350 and camping trailer as I use to own an adventure company there. Love the Mexicans. The real ones, far from the tourist zone (where they are not always representative of the real Mexicans money, money, money). As a new retired, I’m actually searching for a new motorcycle in the next weeks as I sold my BMW1100Rt a couple of years ago. Actually hesiting between Varadero and VStrom. VStrom seems interesting only because it’s widely use by the Mexican police around Cancun and, As I planned to leave the motorcycle in storage there for using on my futur trips. I think parts will be easyer to find. About Mexico. I agree NEVER drink other than bottleled water. Have all your cards in double. Credit, debit. Federal Police are cleaner than the others, usually never ask for money. Army and municipal is different. You can bargain! Also, if you search the web, you’ll find a federal complaint form you can fill regarding police officers. That scares them to death. If you have it and show it, they will usually let you go for free IF YOU DID NOTHING WRONG! If the light was orange… bargain but pay something! 200 pesos is a day of work for them. Don’T spoil! You’ll need to deposit an amout of money on your credit card to enter your vehicule in Mexico. Around 300 or 500 US dollars. YOU HAVE TO STOP AFTER CROSSING the border to pay. It will be refund when you leave. If you don’t you might have problems to bring it back. This will also give you a Mexican registration for your vehicule. Police love it when you don’t have it, they can sease de vehicule… or get paid. BUY INSURANCE! I was an active police officer in Montreal, and in jail in Tulum! I rented a car and decided that I will take the insurance even if Visa is covering. Had a accident at 3 in the afternoon. They put me in the same cell than the hit an run guy (He is probably still there). Even with valid insurance, they have to keep you until they are sure the company will pay. Even when your not at fault (ggod to know) Got out of jail at 3 in the morning only because I speak spanish. Translator works only daytime ;-)! They also told me that Visa insurance can take days to confirm. Watch for the Topes at night. They paint it yellow when they install them but they never paint them again exept in the tourist areas. Have a great trip, I’M coming! I bought my vstrom 2010. Leaving soon!